During the 16th century the Spanish conquistadors brought Catholicism and religious traditions to Peru. Until today, Peru is still a very Catholic country, next to other religions and cults. There are numerous Catholic festivities throughout the year that are celebrated feverishly. 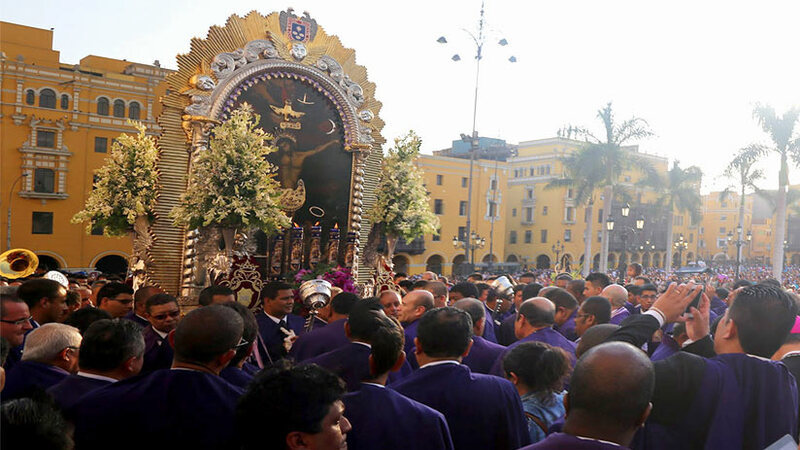 Among them is Semana Santa, or “Holy Week”, that usually starts with Palm Sunday and ends with Easter Sunday or Easter Monday and counts as one of the most important festivities in Peru. They include festive processions, jubilant celebrations and plenty of traditional dishes. If you plan on going for vacations in Peru, this is a great time! Festivities of Semana Santa in Cusco are spectacular. 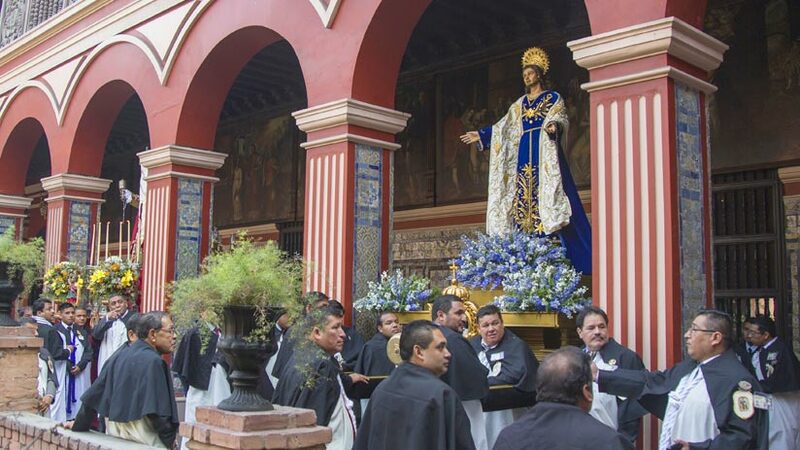 The Easter observations revolve around the Señor de los Temblores, which means “Lord of the Earthquakes” and is also the patron of the former Inca capital. It is believed that during a heavy earthquake on May 31st, 1650, once people took the statue out of church the earthquake miraculously, all of a sudden stopped. 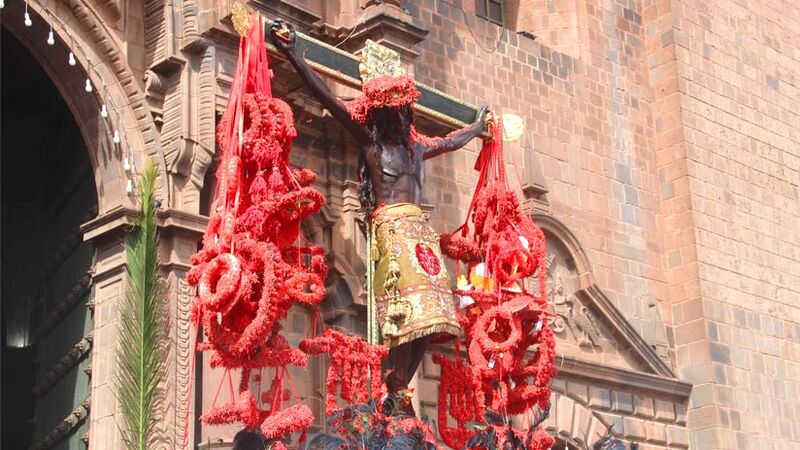 Since then the statue is carried during a 6-hour procession across the Plaza de Armas (Main Square) covered in the red ñucchu flower symbolizing Christ’s blood on Easter Monday. On Palm Sunday (Domingo de Ramos) people commemorate the entrance of Jesus to Israel and Holy Thursday is the day where 12 local and traditional dishes are served in honor of the Last Supper. Good Friday is spent mourning the death of Jesus, as in each city throughout Peru. This time is particularly great for Peru family tours, the whole family can experience the local traditions around Cusco and Machu Picchu and explore the surrounding Archeological Sites. 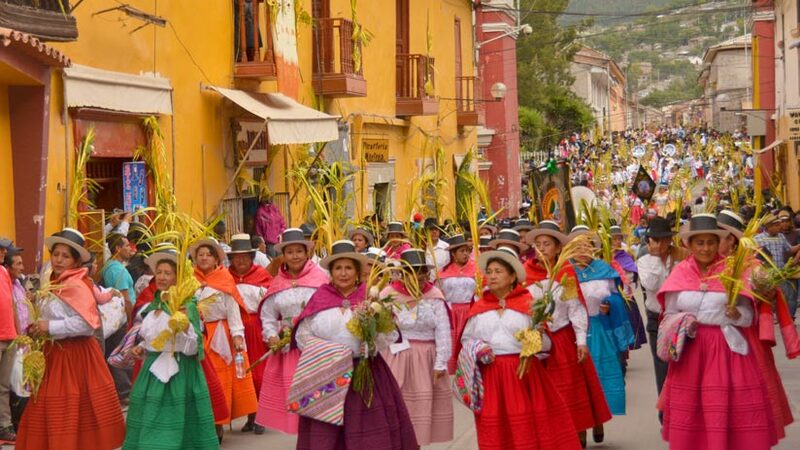 The city of Ayacucho in the Huamanga Province next to Cusco is known for its devoted Semana Santa processions that are considered as the best in the country and attract crowds of locals and foreigners. On Friday before Palm Sunday celebrations start with re-enacting when Jesus met his mother Virgin Dolorosa and continue with mules and palms wandering through the city on Palm Sunday. On Holy Saturday you can experience an open-air market with music, lots of food and crafts attracting lots of people from everywhere after the sad rituals on the day before, Holy Friday. The festivities for Christs resurrection on Easter Sunday begin at dawn with music, fireworks, prayers and eventually, evolve into a huge party. Arequipa is also known as the “White City” due to its beautiful buildings made out of white stone and the close Colca Valley with the impressive Colca Canyon. Therefore, it is a popular choice for any Peru tours in general. 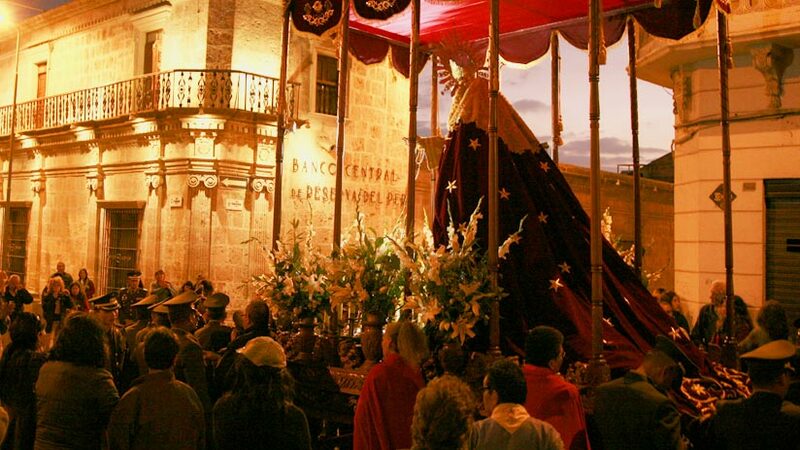 If you are wondering what to do in Peru, do not miss out on Arequipa during Semana Santa. While many traditions and celebrations there are the same as in the rest of Peru, Easter Sunday is different. On this day, an effigy of Judas is burned symbolizing justice and punishment. Afterwards, fireworks light up the sky giving a suitable end to the celebrations. Noteworthy cities to be part of the celebrations are Cajamarca, Trujillo and Catacaos (close to Piura), all of them located in the north of Peru. In Cajamarca, during procession, a dressed donkey is walked to the central church. This donkey is authorized to eat the crops of any field that he wishes, as people believe that lands are blessed wherever he goes. In Trujillo, Christ on the cross is shown and 12 people dressed in all white remove the nails from the crucified Christ. Furthermore, the Virgin Dolorosa is moved into place in a glass case. In contrast to the white-dresses people in Trujillo, devotees in Catacaos are all dressed in black as a sign of respect to the death of Gods son. 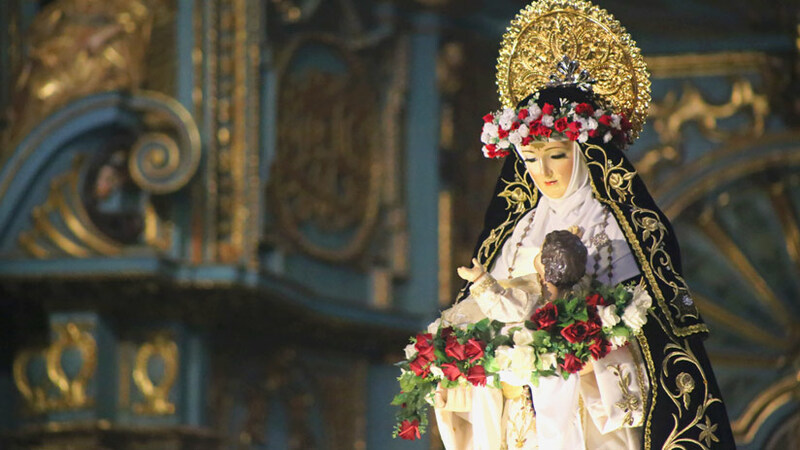 In the bigger city Piura, only a short 30-minute drive away, several processions take place during the Holy Week. What to do in Peru during this time if you are on a budget? As Semana Santa is celebrated in all of Peru and it is quite a Catholic country, you will not only find tourists from other parts of the world, but also local tourists. While it is a great time for vacation here, take into account that, depending on where you choose to go, it can get incredibly crowded. For budget Peru tours it is recommendable to make any reservations for flights, train, hotels etc. well in advance as prices will increase the sooner the festivities and tickets might sell out and accommodations will not have or only very limited availability. However, if you already know that you want to be part of these unique traditions book well in advance to have an incredible experience you will not forget. Peru Activities family vacations, festivities. permalink.